Almost any track pump is better than no track pump but there are a few things to look out for when deciding what’s best for you. There is one piece of equipment every regular cyclist of any standard should have and that’s a track pump. 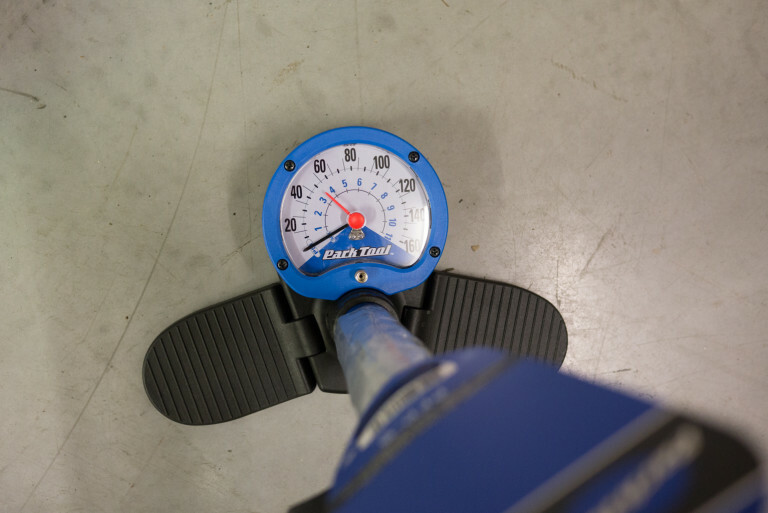 Otherwise known as a floor pump, track pumps make inflating tyres faster, easier and more accurate. We can’t overstate how useful and time saving they are. Every cyclist of every standard will appreciate one and once purchased you will never be without one again. Track pumps are a pretty simple piece of kit; an upright long barrel air chamber, T-handle plunger piston, base plate, longish rubber hose with a ‘chuck’ connecting head and a pressure gauge. They inflate tyres much quicker and efficiently than a frame or mini pump as they put more air in with each stroke. They are also very easy to use as it’s a simple case of attaching the hose to the valve and start pressing down on the handle to inflate. No mechanical skills needed! Go for a pump with a metal barrel rather than plastic. They are more rigid and feel sturdier to use. Don’t worry about weight for once; it’s not something you take out on rides! A good wide base means a more stable pump when pushing down on the handle. Keeping your feet on the base while pumping keeps it steady and helps when you are pushing a lot of strokes to achieve high pressures. I have found triangular or three point bases more stable to use than a straight line base. Make sure it has a pressure gauge, either dial or digital, and it is easy to read. Some dial gauges have an indicator point which you can set to point at the desired pressure so you can easily your target see whilst you’re pumping away. If you struggle with detail distance vision then some pumps have the gauge mounted at the top of the barrel for easier viewing. Some racers prefer a digital display for exact pressures but most of us are happy with a needle dial. For me this is the make or break of a track pump. The way the pump attaches to the valve varies greatly between manufacturers even though they apparently look the same. There are two basic types of chuck head; flick lever and direct. 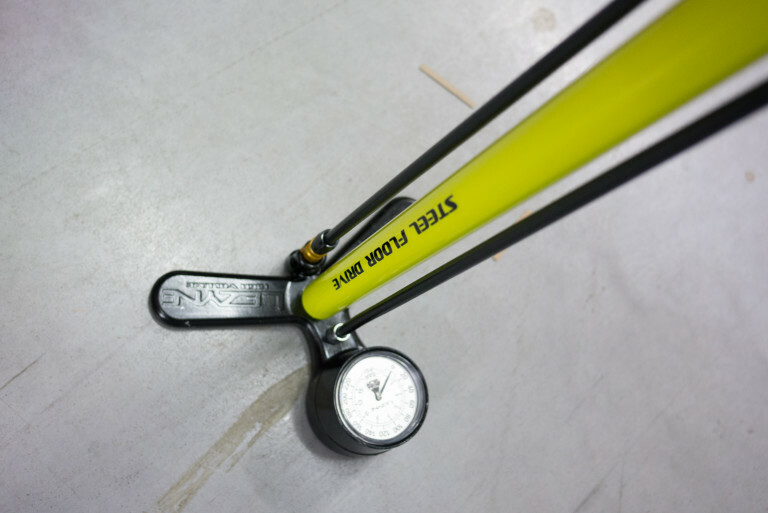 A flick lever model attaches to the valve and is then locked in place with the flick of a lever. This for me is the easiest and most secure all round. The only niggle is when inflating tyres on a disc wheel where the ‘window’ in the disc may not be large enough to fit the chuck head in (although there are adapters available if need be usually). Direct mount heads simply slide on to the valve and are less cumbersome but at very high pressures they need two people to hold the head on. 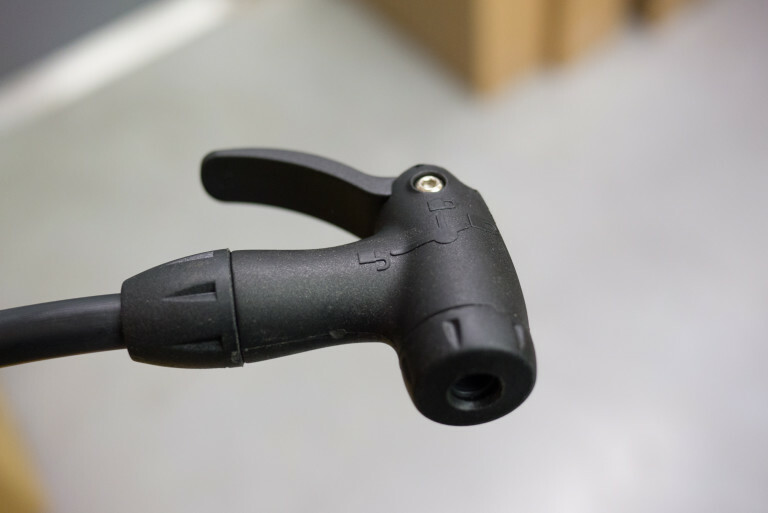 If you’re a VERY frequent pump user then you’ll appreciate the reliability and durability of screw-on chuck heads such as those found on Lezyne pumps. They’re a bit faffy to use but they won’t go baggy or leaky like some flick lever models can after thousands of uses. Some models of chuck head feature a tiny blow off valve for more accurate tyre pressures. The idea being to slightly over-inflate your tyre, wait for the needle to settle and then let air out a bit at a time to hit your desired pressure. More prevalent with road riders with higher pressures. Most modern pump chuck heads will accept both presta (racer) and Schrader (car type) valves. Some chucks have two holes, (one for each type) while some have an enlarged hole which ‘shrink to fit’ when the lever is closed. 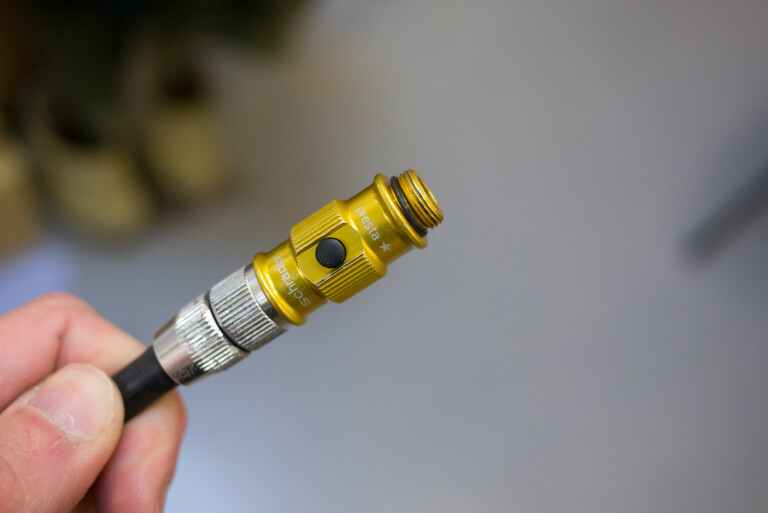 Presta-only models can be converted to Schrader with a small adapter which sits inside the head with a larger outer opening. Road bike tyres need high pressures so go for a high pressure version. Mountain bike tyres need lower pressures but higher volume so go for a low volume one for faster inflating, especially true if you are using tubeless tyres. Not much to say here but some pumps have wider handles so worth bearing in mind if you have large hands. A rubberised handle is also a bit nicer in use too. For those with a retro bent, a classic wooden handle will always appeal. A central groove or hook to hold the hose and chuck head in place for storage is also pretty much a necessity. If you are the kind of person who seems to break everything or are a frequent user then spares availability is well worth bearing in mind when purchasing as it can save you money in the long run. Which track pump should you buy? The more you pay for a track pump the more study and easier to use it will be but there’s no need to blow hundreds of pounds on a luxury one if you’re only going to use it a few times a year. 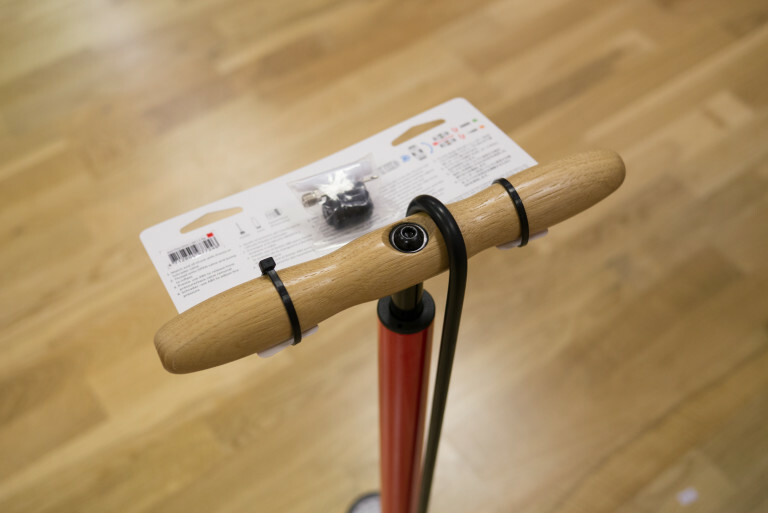 Leisure riders – a basic and inexpensive pump with a gauge will suit you fine. Regular riders – go for a middle of the price range model with metal barrel, good base, easy to read gauge and an easy to use chuck head (frequent use will drive you potty if you don’t get on with the chuck). Well worth checking sale items for older but perfectly good models. Racers – for road riders go for a solid pump with high pressures @160psi, track riders and time triallists @200psi, and an easy to use chuck. 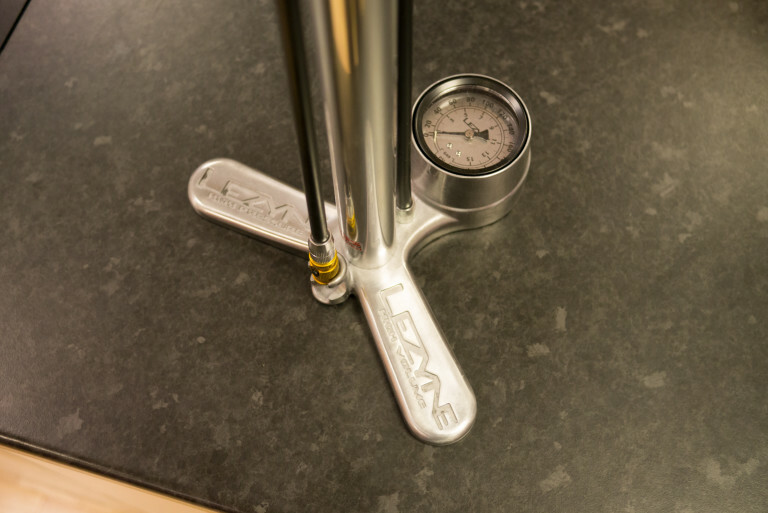 Mountain bike racers will appreciate a high volume pump for quicker inflation and better sealing of tubeless tyres. 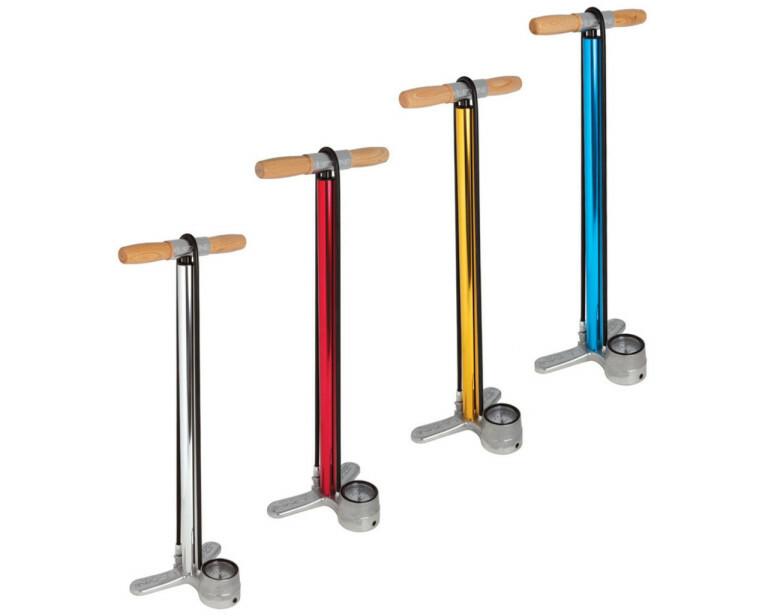 Finally, if money is no object or pure one-up-man-ship then the Silca Super Pista Ultimate floor pump is for you. Tagged buyers guide, floor pump, lezyne, mechanic, park tool, silca, track pump, workshop. Bookmark the permalink.